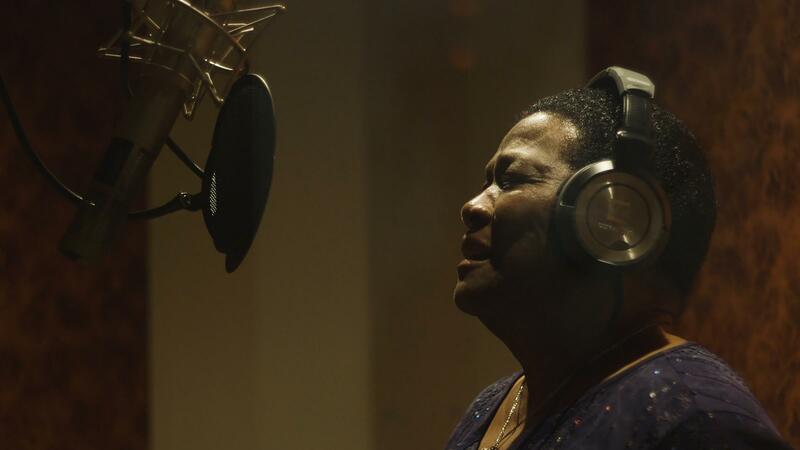 "I just sing what I feel," Mary Lane says. The 83-year-old singer began performing as a kid on the street corners of Clarendon, Ark. before making her way north to Chicago as part of the Great Migration. There, Lane developed a local following playing in clubs, alongside members of the blues pantheon including Howlin' Wolf, Elmore James, Magic Sam and Junior Wells. Along the way, she recorded just one album more than 20 years ago. Now, Lane is back with a new collection called Travelin' Woman, out now. Lane remembers her earliest days performing in Arkansas, where she would sing for the workers in the cotton fields. "I used to go to the field and all the people were out there picking cotton and everything. I'd always be behind. I'd be back there just singing and everybody say, 'Come and sing, Mary. Go on and sing.' And I kept on doing it for years and years as I came up." That experience gave Lane the confidence as a teenager to perform with legendary bluesman Robert Nighthawk. "I went on over and grabbed the mic and and from then on, I was out there, I was up there with him every weekend." Lane's talent and drive took her from the countryside of Arkansas to the city of Chicago in 1957, where she became known in the city for her showmanship, her spontaneous songwriting — "I just sing what I feel" — and working solely off the inspiration blues music gives her. "The music got to be right. You know, I gotta feel it," Lane says. "A lot of musicians out here, they play and they sound good. But you got to have that feel for the blues." On, Travelin' Woman, produced by Jim Tullio, Lane sings of migration, heartbreak and country troubles, all delivered with the signature expression and spirit of traditional blues greats. Lane says she still sings the blues because it upholds the tradition of what the blues meant to her generation. The younger generation of blues artists coming up now, she explains, just don't play it the same. "For real, they haven't experienced the things that I have," Lane says. "Most of the older musicians, they singing about life and the things they feel, and that's how they play the blues and sing the blues. So the younger guys, what they got to sing about? A lot of them don't even know what the blues is." Lane was the subject of the documentary I Can Only Be Mary Lane and released Travelin' Woman under the new Women of The Blues record label as the label's first artist. Lane is taking the recent accolades in stride. "Until I can't do it no more, I'll be out here," she says. "I still got it." When blues legend Buddy Guy calls you the real deal, well, that's no small thing. Recently, he bestowed that honor on 83-year-old singer Mary Lane. MARY LANE: (Singing) I'm a travelin' woman, travelin' woman. Yes, I'm a travelin', travelin' woman. BLOCK: Mary Lane began performing as a kid on the street corners of Clarendon, Ark., before making her way north to Chicago, part of the Great Migration. There, she developed a local following playing in clubs alongside members of the blues pantheon including Howlin' Wolf, Elmore James, Magic Sam and Junior Wells. Along the way, she recorded just one album. And that was more than 20 years ago. Now Mary Lane is back with a new collection called "Travelin' Woman." And she joins us from Chicago from the studios of WBEZ. Mary Lane, welcome to the program. BLOCK: Seems like you have been flying under the radar for a long time, but you're getting a burst of recognition now. You're the debut artist for the new Women Of The Blues record label. There's a documentary film about you. The Cook County Board of Commissioners issued an official proclamation honoring you - not too shabby. How's it feel? LANE: Feel great - and I think it's about time. I've been out here forever and still out here. And I hope out here a while longer doing what I'm out here to do, sing some blues for y'all. BLOCK: Can we talk a bit about your days back in Arkansas? You were, I've read, a teenager when you played with the legendary blues artist Robert Nighthawk. And here's how you described the first time you played with him. You said he didn't even call me up. It sounded so good. I just went on up there and grabbed the mic and started singing. LANE: I just went on over and grabbed the mic. And from that evening on, I was out there. I was up there with him every weekend. BLOCK: Well, where did you get the confidence to do that as a teenager? LANE: In the cotton field (laughter). BLOCK: In the cotton field? LANE: Yeah, in the cotton field. I used to go to the field and everything. And all the peoples would be out there picking cotton and everything. And I'd always be behind (ph). I'd be back there just singing. And everybody say, go on and sing, Mary. Go on and sing. And I kept on doing it for years and years as I came up, you know? When I did make up in my mind that that is what I wanted to be, a blues singer, hey, I didn't stop. I just kept on singing. BLOCK: I would ask you about one of the songs on the new album. This is "Blues Gives Me A Feeling." Let's take a listen. LANE: (Singing) I was born in the country. And they brought me to the city. Yes, I was born in country. And they brought me to the city. Yes, I'm gon' keep on singing the blues. Girl, ain't that a pity. BLOCK: Mary Lane, it sounds like you're singing your life story here. LANE: Yeah. And out of the whole CD, that's the best song. I love that song. I love it because I did come from the country. And I was singing the blues. And I'm still singing the blues. So every time I sing it, I mean, it makes me feel good. LANE: (Singing) The blues - I love it. BLOCK: I've read that the way you write songs is really spontaneous. Apparently, you listen to the music in the studio and come up with the lyrics in your head on the spot. BLOCK: How does that work? LANE: I don't know. I mean, I guess when they play the music, I just sing what I feel. I be trying to, you know, put it in a respect where it's saying something and it means something and things I done did and things that happened in my life. BLOCK: So there's something about what you're hearing from the band that'll just inspire you to start thinking of words to go with that tune. LANE: Yeah. The music - the music's got to be right. You know, I got to feel it. You know, there's a lot of musicians out here. They play, and they sound good. But you got to have that feel for the blues. BLOCK: Most of the songs that we've been listening to have, you know, a full-band arrangement. There's Hammond B3 organ. And there's harmonica and electric guitar. But there's one that is acoustic. It's just you and a guy playing acoustic slide dobro. This is "Make Up Your Mind." LANE: (Singing) Why you left me - left standing? Why you left me standing here by myself? Yes. Why you left me - left me standing - left me standing here by myself? 'Cause you know, you know I love you - seem like you want somebody else. BLOCK: Wow. Tell me about this song, Mary Lane. LANE: It was a struggle trying to get all these tunes together, just coming up with the lyrics and everything myself. And then after I got them all together, then I got to relearn them. And some of them, I still haven't gotten together. But I'm trying. BLOCK: This is a great song. It's a great song. BLOCK: When you think about your generation of blues musicians, there's you. There's Buddy Guy, a few others who are left who - a lot of whom migrated from the South up North, in your case, to Chicago. BLOCK: What do you think that means for the future of your music, of blues music? LANE: Well, you know one thing about the future of the blues like Buddy Guy and me and Howlin' Wolf and all them have done and everything - you know, the younger generation that's coming up now, they sound great. They play the blues. They play the blues. But it's not the blues that I've been into all my life. I can sing the blues behind it. But I don't feel it with the younger guys and stuff that play the blues now. You know, they sound good and everything, but the feeling's not there. BLOCK: What do you think's different about it? LANE: For real, they haven't experienced the things that I have and the things that most of the older musicians - they singing about their life and the things they feel. And that's how they play the blues and sing the blues. So the younger guys, hey, what they got to sing about they done felt? A lot of them don't even know what the blues is. BLOCK: I wonder if that's partly what keeps you going in music, just feeling like this is something that will be lost with your generation. LANE: Well, I think so. And like I say, until, you know, I can't do it no more, I'll be out here. I still got it. BLOCK: That's singer Mary Lane. Her new album is called "Travelin' Woman." And the documentary film about her is "I Can Only Be Mary Lane." Mary, thanks so much for speaking with us. LANE: Thank you so kindly for talking with me. LANE: (Singing) Bad luck and trouble, they run hand in hand. I say bad luck and trouble - they run hand in hand. You got to treat me right if you want to be my man. Transcript provided by NPR, Copyright NPR.